At our annual Kennywood picnic day, my dad did his tradition of bringing dollars for the duck and fish ponds. Apparently, one of our kids is a ‘lil lucky duck. Because you see, all that they knew was “pick a duck, get a ‘lil stuffy prize”. But, as you can see, the winner ducks DO exist. 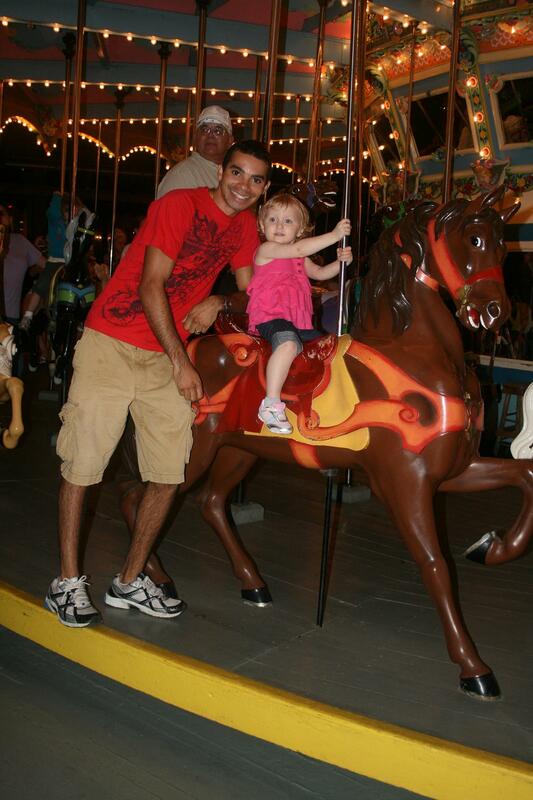 Last year when we went to Kennywood, our ‘lil girl rode a few rides, but was by no means brave. In May, she got a bit better, showing her ‘lil brother the ropes. This year, oh.my.gosh. 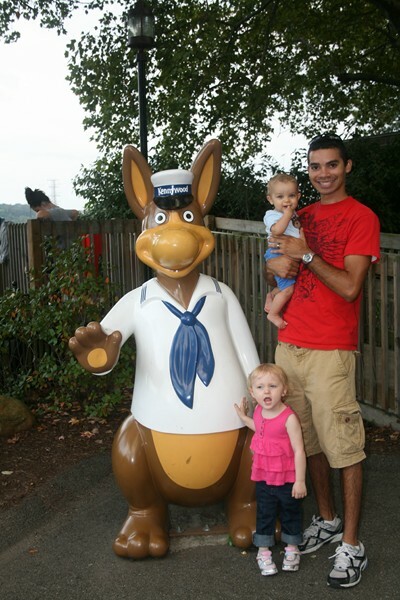 Two of her 2nd cousins are a year older than her, and I remembered them riding the Jack Rabbit last year. As we walked to KiddieLand, I decided to “just in case” see if she was tall enough. After measuring up, she kept telling me she was going to ride the big roller coaster. I didn’t believe it one bit. She tore up KiddieLand and gave up Bingo to ride with the older kids. When we met back up, my cousin asked if she could ride the Jack Rabbit. Surprisingly, I said yes, but only if Greg would ride beside her and hold her tight. My stomach was full of knots. We caravan’ed our way to the Jack Rabbit, and my nerves got worse. You see, I do NOT ride roller coasters. In high school, I sort of stood up on the Racers and when I attempted another coaster at Busch Gardens, it got stuck at the top of the first hill. Behind Idlewild’s wooden coaster and the Wild Mouse, I do not ride coasters. There is no convincing me, either. Anyways. As they stood in line, she had to potty, so Greg handed her to me and I took her. She was so happy that I was letting her do this, and I had to ask her if she was really my child. Before we knew it, they were up in line and it was time for her to board. The whisking away to the car happened all too fast. A family friend and I watched as our baby girls were swept away on the coaster. She had been there last year, as her E is in her 2nd year of riding. I literally paced back and forth, glad my parents were sitting with ‘lil Man (who, by the way, told me NO he is not riding the Jack Rabbit next year). Before I knew it, they were back. She started run-dancing down the ramp to me, giggling. When I asked her if she liked it, she got all serious and said NO, reaching out for a hug…then exploded in giggles. T picked her up and off they went to laugh at their photos. Oy. My ‘lil girl is not so ‘lil anymore. Sunday seemed like the perfect day for a trip to Kennywood, so off we went! The day was spent in Kiddieland, and we were surprised how ‘lil Man wasn’t as into it as we expected. A had an amazing time, but ‘lil Man was a bit scared to leave our side. Take the Whip for instance. He was great when it whipped toward us, but started bawling as the Whip went away. It was a complete coaster of emotions for ‘lil Man. And the Mouse Pounce and Crazy Trolley (which we rode with them) had him clinging to the bar for dear life. 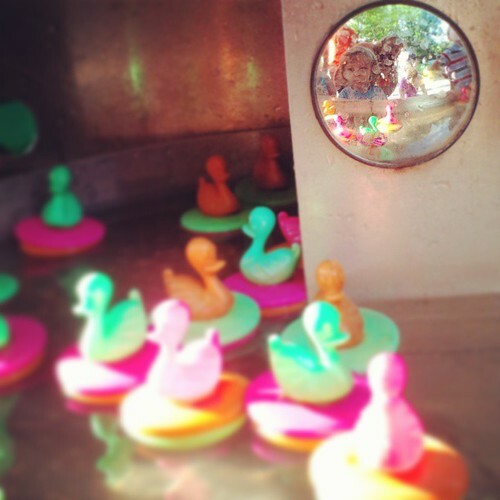 Of course, he really liked playing with the ducks (until we had to walk away). A was a ham, riding rides with no care in the world. One of her favorites was the motorcycles. And who doesn’t like the carousel? …enjoying a ride on the carousel at Kennywood. As a kid, one of my favorite things was going to Kennywood for my grandfather’s Railroad picnics. I am so glad I get to share this fun with my “own” family as our kids make their own memories.